The American author F. Scott Fitzgerald, a legendary figure of the 1920s, was an extremely observant artist, a beautiful writer, and an exceptional craftsman. His tragic life was ironically similar to his romantic art. On September 24, 1896, Francis Scott Key Fitzgerald was born into an Irish Catholic family in St. Paul, Minnesota. His mother was from a wealthy family, and his father, Edward, was a furniture manufacturer. After Edward's business failed, he was employed by Proctor and Gamble, and the family transferred to Buffalo, New York. The family lived for some years in Buffalo and Syracuse; but in 1908, when Fitzgerald's father lost his job, they returned to St. Paul. 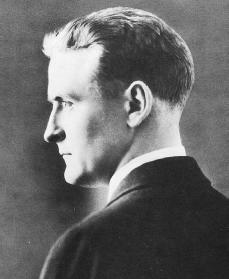 For the most part, Fitzgerald was privately educated; he attended Newman School in Hackensack, New Jersey, from 1911 to 1913 and worked on the school paper. Fitzgerald enrolled at Princeton University in 1913. There, he worked on The Princeton Tiger, a magazine published by the university. He also wrote for Princeton's Triangle Club, which was a distinguished organization that put on musicals. Because of ill health and low grades, he left the university in 1915. He returned to Princeton in 1916 but left a year later without a degree and joined the U.S. Army as a second lieutenant. Stationed in Alabama in 1918, he met Zelda Sayre, then eighteen years old; he would marry her a few years later. After he left the army he took an advertising job for a brief period. Back home in St. Paul, he finished his first novel, This Side of Paradise, which was published in 1919, and that same year he had remarkable success placing nine short stories in leading magazines. Upon publication of This Side of Paradise (1920), Fitzgerald married Sayre in New York City. Of this period he later recalled riding up Fifth Avenue in a cab—young, rich, famous, and in love (he might easily have added handsome)—suddenly bursting into tears because he knew he would never be so happy again. He was right. Despite great earnings and fame, he and Zelda lived grandly and lavishly—but tragically. A daughter was born in 1921 after the couple had spent some time in Europe. When Fitzgerald's second novel, The Beautiful and the Damned (1922), and a collection of short stories, Tales of the Jazz Age (1922), sold well, they rented a house on Long Island and ran into debt because of their reckless spending. Fitzgerald attempted to recover by writing a play, The Vegetable (1923), but it was unsuccessful. The Fitzgeralds went to Europe for over two years. The high points of this trip were publication of The Great Gatsby (1925) and the beginning of Scott's friendship with Ernest Hemingway (1899–1961). In 1927 Fitzgerald went to Hollywood on his first movie assignment. Afterward the Fitzgeralds again went overseas several times. Zelda's first major nervous breakdown, in 1930, and her following treatment in a Swiss clinic became the basis for Fitzgerald's next novel, Tender Is the Night (1934). Zelda spent the rest of her life in and out of treatment centers, and Fitzgerald's own life ran a similar unfortunate course. This Side of Paradise (1920), an autobiographical (having to do with one's life story) novel, tells of the youth and early manhood of a Princeton undergraduate. The climax occurs when he shifts his devotion from football to literature, while at the same time he grows in character. This work struck a nerve in the reading public, chiefly for its new type of heroine—the "flapper," a young woman who goes against the idea that a woman must be stricter in her morals and behavior than a man. She smokes, drinks, dances, and is considered to be somewhat low in her character and conduct. The Beautiful and the Damned (1922) deals with a couple who is concerned with only themselves. Tony Patch, grandson of a millionaire, and his beautiful wife live extravagantly on the expectations of Tony's inheritance, but the grandfather discovers Tony's alcoholism and wastefulness and disinherits him; however, after the grandfather dies, the will is broken. Ironically, the inheritance only worsens the destruction of Tony's morals. As with most of Fitzgerald's novels, the autobiographical elements are fairly obvious. The Great Gatsby (1925) is an American classic, generally regarded as Fitzgerald's finest work. It contains the themes that pass through all of his fiction: the hardened indifference of wealth, the hollowness of the American success myth, and the sleaziness of the wealthy lifestyle. It is the story of Jay Gatz, a successful, vaguely disreputable man, who has a background of poverty and has altered his name to "Gatsby." He emerges as morally superior to the people who take advantage of his parties and the reckless rich whom he so hopelessly imitates. Gatsby dies unrealistically attempting to reclaim his former love, Daisy. The Great Gatsby is a major contribution to the writing work of the twentieth century. The theme of Tender Is the Night (1934; later restructured by Malcolm Cowley) is parasitism—the health of one person gained through harm to the other—and the facts bear an unmistakable resemblance to Scott and Zelda's marriage. The Last Tycoon (1941), published after Fitzgerald's death—after Edmund Wilson put it together from Fitzgerald's unfinished manuscript—is the story of a movie producer. Though Wilson calls it Fitzgerald's most mature work, it has received very little critical attention. Many regard Fitzgerald's short stories as his best work. The titles of his collections are a representation of the spirit of the times. Flappers and Philosophers (1921) contains "The Off-Shore Pirate" and "The Ice Palace." Tales of the Jazz Age (1922) includes "May Day" and "The Diamond as Big as the Ritz." The best-known pieces in All the Sad Young Men (1926) are "Winter Dreams," a basic example of Fitzgerald's romantic vision, and "The Rich Boy." Fitzgerald's final collection, Taps at Reveille (1935), includes "Babylon Revisited," perhaps his most widely anthologized (stories written by different authors that are collected and published together) story. Fitzgerald earned over four hundred thousand dollars between 1919 and 1934, but he and Zelda lived so expensively that they barely managed to cover their bills. When Tender Is the Night failed to excite interest, financial problems became critical; by 1937 Fitzgerald owed forty thousand dollars despite continued earnings from magazine stories. Zelda had been permanently returned to medical care in 1934; and the years from 1935 to 1937 saw Fitzgerald's own decline—increasing alcoholism and physical illness—which he described with emotional openness in articles that appear in Esquire in the mid-1930s. In 1937 Fitzgerald signed a movie contract at a weekly salary of one thousand dollars. His relationship with gossip columnist Sheilah Graham during the last three years of his life is described in her Beloved Infidel (1958). After two heart attacks Fitzgerald died on December 21, 1940. Zelda Fitzgerald died in a fire in 1947 at Highland Sanitarium, Asheville, North Carolina, leaving a novel, Save Me the Waltz (1932). Prigozy, Ruth. F. Scott Fitzgerald. Woodstock, NY: Overlook Press, 2001. Ring, Frances Kroll. Against the Current. San Francisco, CA: D. S. Ellis, 1985. Taylor, Kendall. Sometimes Madness Is Wisdom. New York: Ballantine Books, 2001. Turnbull, Andrew. Scott Fitzgerald. New York: Scribner, 1962.